High-functioning fatigue. Pride in overworking and extending yourself. Getting the job done at all costs. It's the "exhaustion complex" in full force. Join artist and educator LaTreice Branson in this vivacious and personal exploration of the challenges of being an exhausted woman. Follow LaTreice's musical journey from exhaustion to relaxation and self-love, and then join in, re-setting your heart, mind, and body, with a joy-filled, interactive drumming finale. 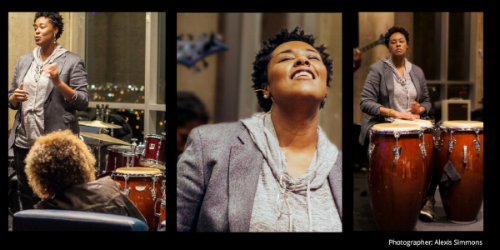 LaTreice V. Branson is an educator, community activist, and drummer from Philadelphia who enriches her community through interactive drum performances and gatherings that often feature impromptu audience collaborations. Exploring the creation of new soundscapes through improvisation by inviting musicians and non-musicians alike to engage in the process of arranging music, LaTreice has influenced a reciprocal culture of sharing that unites marginalized communities. Her free and publicly-accessible drumming events uplift gender-inclusivity and live collaboration. She also is the founder of Drum Like a Lady, a community cooperative whose mission is to provide a safe space for women of all ages, ethnic backgrounds, religious beliefs and lifestyles to express their uniqueness through collective drumming, dance, music education, and mental health advocacy. LaTreice received the Leeway Transformation Award in 2016.